Like many of us, singer/songwriter, Seth Swirsky has always loved the Beatles. As a youngster, living in Long Island, New York, he and his little brother happily bounced on their beds to the sounds of the Fab Four. As an adult, with kids of his own, Swirsky decided five years ago to embark on a journey to interview people who have met the Beatles during their heyday and beyond. 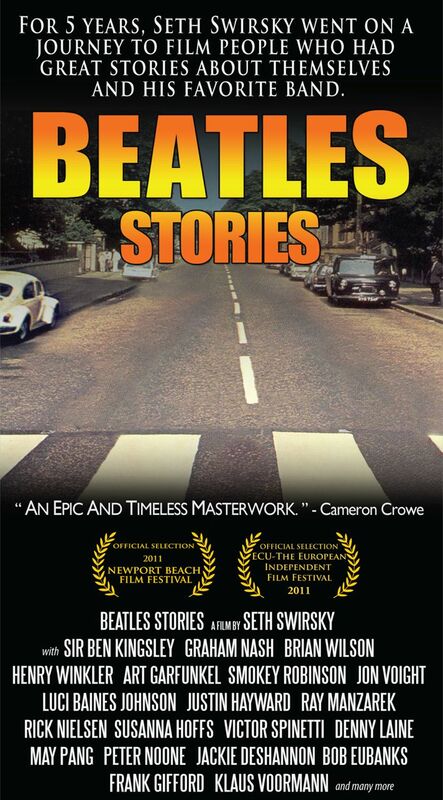 After conducting over 100 interviews, 55 of them made the final cut of Swirsky’s 75 minute documentary, “Beatles Stories” that had it’s world premier at the European Independent Film Festival in Paris on April 3, 2011. George Harrison’s first girlfriend, from before he was in the band, talks about how sweet George was as a 14 year old. Henry Winkler recounts a random meeting with Paul McCartney on a New York street where the Beatle was as happy to meet “The Fonz” as Winkler was to meet him. Former head of Apple Records, Jack Oliver, remembers waking Paul McCartney to ask if he was okay after rumors that McCartney was dead flooded the media. McCartney told Oliver to F-off, proving that, yes, he was still very much alive. Artist/bass player, Klaus Voormann, talks about how everyone was speechless when they first saw his artwork for the Beatles album, “Revolver.” It was only when John Lennon said it was brilliant that the praise began to pour, with Beatles manager, Brian Epstein even shedding a few tears. On the technical side, Beatles engineer, Norman “Hurricane” Smith discusses various recording techniques used by the band. Smith worked with the Beatles from the day they auditioned for their record deal, (June 6, 1962) through their ”Rubber Soul” album. He engineered every Beatles song from, “Love me Do” to “Michelle,” just under 100 songs in all. His contribution to this fine film is alone worth the price of admission. Other interviews include Sir Ben Kingsley, Smokey Robinson, Brian Wilson, Jon Voight, former First Daughter Luci Baines Johnson, Donovan, Art Garfunkel, Rick Nielsen from Cheap Trick, Chris Carter, host of Breakfast with the Beatles, Susanna Hoffs from The Bangles and Joey Molland from Badfinger. Swirsky’s subjects recount sincere, fond recollections of “being in the presence” of the greatest rock band ever. With this documentary Swirsky gives the viewer the chance to be a fly on the wall from those magical days gone by. This is a must-see film for anyone who loves the Beatles, or for anyone who wished they could have been there in the swinging 60’s, living the life that so few got to experience. 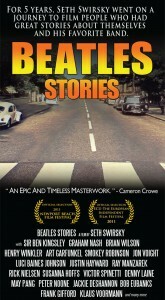 “Beatles Stories” next screens at the 2011 Gold Coast International Film Festival in New York.